I don’t claim to be an expert in drama or even a mediocre-at-best actor. I do some on-camera work here and there but not generally someone who spends his life in the limelight of the camera. This last weekend – which in reality was a red-eye Friday night and then returning this evening/morning due to the fact I have to work Monday morning. We headed to New York so that she could visit a college and get an idea what she wanted to do for drama and what it’s like in a city this huge. Part of her homework for her drama focus in school is to see a couple plays over the summer so we decided to make this weekend fill in one of those. Abbi chose the play – a Broadway production of a British play called “One Man, Two Guvnors.” We both thought it would fit our sense of humor and figuring it was sort of the culmination of our day in New York worth the price of admission. Both of us figured if we could get a few laughs before the weekend was up we’d have a decent end to the day. Abbi and I were somewhat familiar with James Corden, the play’s lead. American audiences will likely know him more from the most recent “Three Musketeers” movie from 2011 than anywhere else. He’s beren on the BBC’s “Little Britain,” “Gavin and Stacey” and even the sci-fi extravaganza “Doctor Who,” which is where we’d first seen him. Now, give us some credit, we didn’t think we were walking into a Broadway show to see a flying TARDIS. To be honest, neither of us was in the mood for a full Broadway production. I had no desire to see “Rock of Ages” or “Mama Mia.” Instead, we wanted to see something different. A brief history: One Man is based on the play “The Servant of Two Master” and is done in the style of Commedia dell’Arte. It’s very much a scripted play with observational and improvisational elements spun throughout. Yes, we knew this going in. No, we didn’t think we’d enjoy ourselves as much as we did. To be fair, I’d seen that Corden won the best actor Tony for this year and that made me think we were in for a good show. But it takes, in my humble opinion, a group of actors of immense talent to handle the curveballs thrown them when members of the audience seem to have seen the play before and are intent on messing with the cast. Without giving too much away, theater goers who pay for the best seats are doomed to become part of the show in at least two or three places. This isn’t a criticism, in fact it’s so brilliant I was crying from laughing so hard throughout the show. An audience member who seems to have arrived in New York from a major tropical vacation – made obvious by his all-too-tan skin – became subject to queries from Corden like “Where was your vacation, the SUN!” and “too many jokes, I can’t get them all out . . . ” only to be told in the end “I’m finished, really I am” and then beginning a short rendition of the Oompa-Loompa song. It is the hiccups and the unknown that makes this play such a delight. Added to that the music hall/variety act that transitions between scenes – where every member of the play gets a chance on stage with the “band” that warms up the crowd – and it’s simply one of the best plays running. I was disappointed when few I knew had heard of the play upon mention. I was even more delighted when – after a year of loss, sadness, and hardship from losing my wife and my daughter losing her mother – we were able to laugh with abandon and vigor unlike anything we’d done in the last couple years. 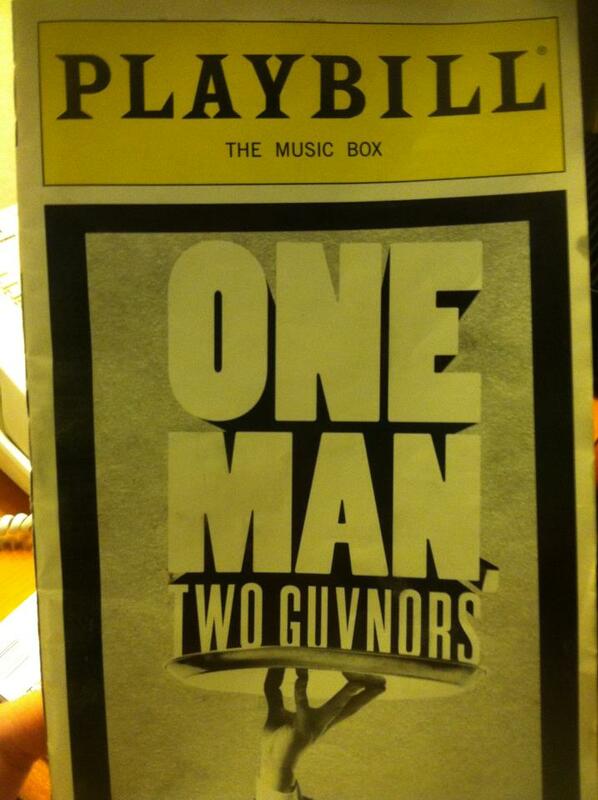 One Man, Two Guvnors ends in September. If you go to Broadway to be serious, well you’re missing out. I, on the other hand, was clutching my side on the way back to our hotel because I had laughed so hard I was crying. For a man whose acceptance speech for his Tony was simultaneously funny, sweet, and admirable I have to say it comes as no surprise after seeing his play on Broadway. The supporting cast of Oliver Chris, Jemima Rooper, Tom Edden (who could easily double as John Cleese) and a crew of many others, you should see the play. It’s Marx Brothers meets Monty Python. Farce with the Minister of Silly Walks thrown in. I’m no professional critic, but having walked in wondering what I’ll expect it came as a tremendous pleasure to know I could laugh again with abandon.